The Hen of the woods is what started me off on this adventure. You can read more about it here on wikipedia, but quickly: Hen of the woods is generally found near oak trees in the late summer to fall, is renowned for potentially having a host of medical uses, and can grow to be over 50 pounds! One saturday afternoon I was surfing the web and read about some of the most common edible mushrooms- including the Hen of the woods. As my property abuts a large forest, I decided to take a walk and see what I might find. I did not make it more the 50 feet into the woods before I came across a beautiful specimen- or rather three around a single tree! The odds of reading about a random mushroom online, walking a minute behind your house, and immediately finding a highly sought after mushroom in prime ripeness seemed completely implausible, so I walked on- not believing that this huge (more than 15 inches wide) mushroom could be the Hen of the woods. The next day I read about it some more, and visited it again- and it was indeed the Grifola frondosa! Bugs were starting to swarm around it- but I managed to harvest a decent amount of clean mushroom. Hen of the woods is a great starter mushroom as it is unique in appearance, and the only mushrooms that look somewhat similar are not dangerous- and about as palatable as wood- so they are unlikely to be confused for long. Here is my harvest- which is now frozen (except for those I had on a tasty egg sandwich! 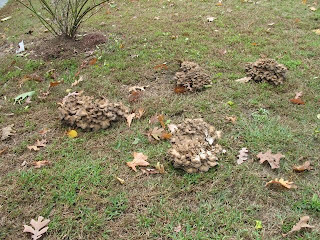 ), and the second picture is a group of Grifola growing on a lawn were an oak tree used to live. Taste: firm with a nice texture- not unlike chicken, fairly mild. Nice website, easy to read...not much latin, just enough to start learning the names. You see, Im a beginner also...and hens were MY first...one because what you said is true...hard to mix this up, and if you do, the look alikes are either not bad or woody, so you can't lose. The other reason was because this is the mushroom my parents, italian immigrants, picked. Youre in RI, so you must be SWARMED with Italian hen hunters!! Im from CT and went to school at Providence College. I really am trying to read up this winter, trying to expand my picking next year....which mushrooms do you recommend me graduating to?? I really want to start right off with morels in the spring...I know they are rare, but supposedly they are here, in CT. This winter, Ive been looking for chaga..and I think I may have finally found one. Well, again, nice websit. Im glad you are a beginner (but, really, you know a ton, for a beginner)cause you can better understand the difficulties of learning.